THERE’S BEEN A huge drop off in the number of candidates hoping to fly to the Red Planet as part of the ambitious Mars One project. 706 people are still in the running around the globe — down from the original selection of 1,058 announced at the start of the year. 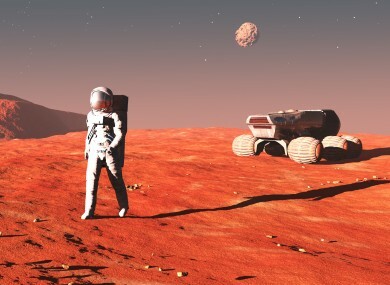 Candidates have been submitting medical tests to Mars One HQ over the last few months. The initial 1,058 were also given a deadline to switch their online profiles on the official site from ‘private’ to ‘public’. Besides not being able to provide the medical statement or make their profile public, several others withdrew their candidacy due to personal reasons. It’s expected regional interviews will be carried out in the next few months. Three Irish-based candidates were included in the initial shortlist: scientist Dr Joseph Roche, IT professional Steve Menaa, and Dr Catherine McGrath. A Mars One spokesperson confirmed to TheJournal.ie that all three were still in the running to take part in the mission. Email “A third of the 'Mars One' hopefuls have dropped out ... but all three Irish candidates still in the running”. Feedback on “A third of the 'Mars One' hopefuls have dropped out ... but all three Irish candidates still in the running”.